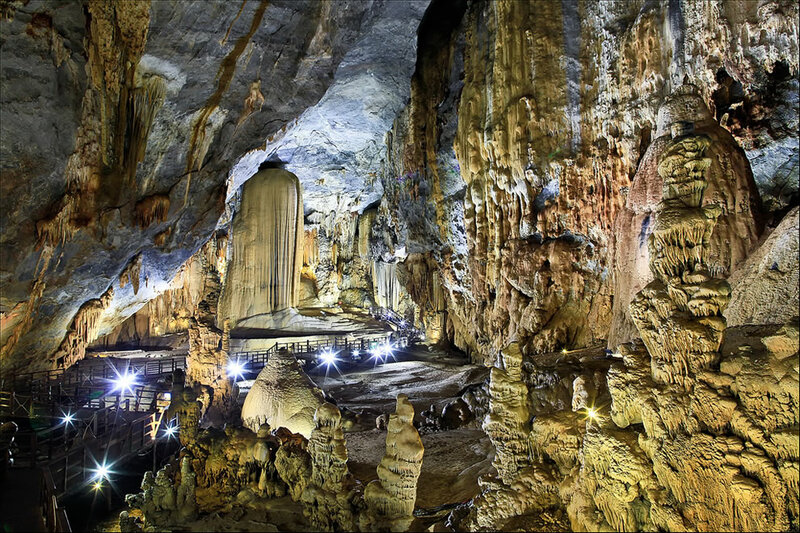 Hidden in the thick tropical forest of Vietnam is a land of phenomenal caves. Phong Nha-Ke Bang National Park contains the oldest major karst area in Asia; the karst is believed to have formed 400 million years ago, during the Palaeozoic era, With every cave discovery, that cave is considered the largest and longest in Phong Nha-Kẻ Bàng, only to learn later that yet another even more massive cave has been found. This national park is home to the largest cave in the world and is said to be the home of the many of the world’s most beautiful caves. It’s famous for its cave and grotto systems, about 300 caves and grottos, of which only 20 have been surveyed by Vietnamese and British scientists. UNESCO named it a World Heritage Site for its geological values. Spectacular stalactites and stalagmites create an underground fairy-tale-like world where formations look like the caves possess jagged teeth or home to strangely alien trees. Visitors to Phong Nha-Ke Bang National Park most often visit the massive Paradise Cave and huge Phong Nha Cave as seen below. If you don’t expect to ever travel to Vietnam, then here is a virtual trip to see the mysterious and massive world hidden beneath Phong Nha-Ke Bang National Park .